I'm very close to finishing my research , and there be demons. The final third looms. Things are coming together. And paradoxically. They're also coming apart. There is no job security in my life right now - no financial security - no home or land security. I normally respond to all of this by selecting a lower target and taking it out. Something that is easy to accomplish and has a real or tangible benefit. Perhaps the important thing in my life is whatever impact I will have in my field, and whatever value my insight will be there. Its hard to study language, and speech. Most people tend to hyper intellectualize it. But language is a paradox. Like a diamond , the only thing that can reveal the structure of language is language. The many facets of language reveal themselves only to those who have a unique ability to be able to get away from it all. And at the same time, be able to carefully express themselves within the constraint - or freedom - of the written word. Wave information is cyclical, and partly chaotic. Waves superpose across one another and like a coupled spring, they can quickly become unpredictable. Perhaps language is like that at its midst - just as the sea , in deep water - is a complex and unknowable set of winds upon waves and wave against wave. The picture you see above is visual solution to a boundary value problem. These are the harmonic two dimensional standing wave patterns we can produce by making sounds. 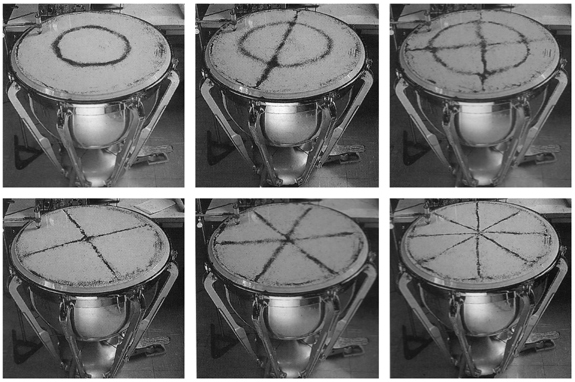 The dust collects across the surface of the drum where there is no vibration. I think, like life, and also , perhaps , how we find the strength to move forward in our darkest hour - we find the center points in our lives - the places where the vibrations all cancel to zero - and we remember them. They are like markers that guide us - the meditations that enlighten us and keep us centered. I believe we listen for these types of patterns in speech. Laughter. Silence. Give and take. To impart structure and expression to meaning, speakers use intonation, stress, rhythm, tone of voice and silence in the form of pauses. Linguists refer to this nonverbal meaning as prosody. Prosody is a level of linguistic analysis that is systematic and principled. Prosody is an element of grammer, the implicit knowledge that native speakers have about their language. There are basic rules in prosody. And the very first one is. Leave the tender moment alone. Its not as easy as it looks. In the darkest hours, as we near the center - and suddenly find how little we've actually accomplished + how far we truly have to go - we are all tempted to just copy it all off the net somehow. Find those places in your life. Its amazing what will turn up late night listening to Mahler. Or pushing yourself to the limit. Finding whatever change you can accomplish. Actually making something really work. Stopping the train, to get off - is not easy. Try it.